Many people are familiar with the Chabad/Lubavitch movement. There are Chabad Houses all over the world in the most unlikely places, the most well known of which was probably the Chabad House in Mumbai, India, which was subject to a deadly terrorist attack in 2009. It is therefore no surprise that Chabad/Lubavitch has a large base in Safed. 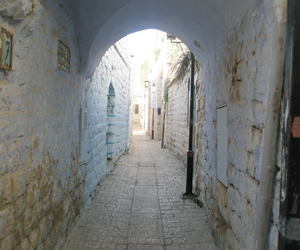 There is a Chabad House in the Old City, the Ascent hostel, various synagogues, schools, seminaries and yeshivas as well as a Chabad neighborhood, Kiryat Chabad, up in the Canaan area of Safed. They also run soup kitchens and offer a "meals on wheels" service to the housebound. Located on Chatam Sofer Street, in the Old City, next door to Rav Silberman Lane you will find the Tzemach Tzedek Chabad Synagogue. It is in the process of being renovated and conditions at the moment are a little primitive. However when the building work is completed the synagogue will be a very pleasant place to pray and study. The synagogue has a kollel (study center for married men) and offers other classes on a regular basis as well as talks and lectures by visiting speakers. If you are someone who likes to get up late but still be able to go to services, this Chabad synagogue offers one of the latest starting times in Old City. The minyan consists of about 15 men during the week and around 30 - 40 men on Shabbat. There is a small ladies gallery is upstairs. The congregation is under the auspices of Rabbi Chaim Kaplan, who can be contacted on 04 692 1860 and services follow the Chabad prayer book tradition. Shacharit: 9.00 am 7 days a week, all year round. Mincha: daily 15 minutes before sunset. Maariv: daily 45 minutes after Mincha. The Chabad House in Safed is located at 28 Chatam Sofer Street, just along from the Chabad synagogue. The Chabad House runs under the directorship of Rabbi Gavriel Marzel, who offers a large program of activities in the building. These include after school clubs, art exhibitions for the general public, and of course a variety of Torah classes. These classes naturally put an emphasis on Chabad Chassidic teachings. The building also has a small library available as well as other services. The Chabad House is also used by the wider Safed community for a variety of events, including Purim plays, Chanukah parties, and study workshops. As there is a small kitchen available for events it is also possible to hold a small bar-mitzvah or other celebration in the Chabad House.